In the season premiere of ABC’s Fresh Off the Boat, Taiwanese immigrant Jessica Huang (the tremendous Constance Wu) gleans her sense of belonging from the culture she grew up in, even as the men in her life—her husband, Louis (Randall Park), and their three sons—embrace America before her eyes. She prefers haggling at the night market to Walmart’s “Everyday Low Prices” and winces when her children choose McRibs for lunch, careful to nurture her connection to her birthplace even after years in the United States. When the Huangs arrive in Taiwan for her brother-in-law’s wedding, in the cleverly titled “Coming from America,” even the details of a customs form signal a long-awaited return: “I’m home,” she announces, with a certain sparkle in her eye. In the episodes since, Nahnatchka Khan’s sitcom, now in its third season, has continued to elicit humor from this meeting of two worlds, from the lies Eddie (Hudson Yang) tells about Taiwanese culture to get out of eating the cafeteria’s vegetables to the brief interest Evan (Ian Chen) develops—to his mother’s dismay—in a friend’s Christian church. But in a handful of entries, comprising the season’s most remarkable arc, it’s Jessica’s legal relationship to her adoptive country that’s come to define Fresh Off the Boat, an evolution from issues of culture and class status to the meaning of citizenship itself. Quietly, and rather brilliantly, the series has established itself as a staunch opponent of Trumpism’s central plank, xenophobia, by reminding us that the social compact is stronger, not weaker, when we replace the rhetoric of border walls with that of big tents. It’s here, in “Citizen Jessica,” that Fresh Off the Boat offers its most earnest critique of American government, one that uses the relative softness of the sitcom form to its advantage. As Election Day approaches, pitting Bill Clinton against Bob Dole, the pragmatic realtor, wife, and mother—ineligible to vote—finds her interest in politics awakened by the tax consequences of a recent commission, and when she learns that the restaurant’s chef, Hector (Noel Gugiemi), is in arrears with the IRS, she alerts the Immigration and Naturalization Service—only to be swept up herself, for failure to renew her green card. It’s the sort of mean-spirited, momentous act that network comedies often try to paper over with such swift reversals, but alongside its disappointing nonchalance about the whole affair, “Citizen Jessica” contains a clear-eyed assessment of the need to separate process from politics. Jessica, goaded into her position by The Wallkeepers’ manipulative campaign, soon finds herself being “treated like a criminal,” too: One of the dangers of draconian laws, the series suggests, is that their reach so frequently outstrips their stated intent. Anchored by Wu’s charismatic performance, it’s Jessica’s foibles that throw the season’s political thrust into sharpest relief, for she, like all of us, is an imperfect vessel for the responsibilities of representative democracy. (When she’s mistakenly selected to serve on a jury, Jessica angles for the role of foreperson, or “jury boss,” and then causes a mistrial when she says to the defendant, upon reading the verdict, “Stop burning things, you weirdo! I hated you the moment I saw you.”) At the heart of our particular form of government, Fresh Off the Boat maintains, is the will of the people, and with them come all of their flaws. Indeed, the series places Jessica’s eventual decision to apply for citizenship—which culminates in tonight’s midseason premiere, “How to Be an American”—in the context of several commonly shirked duties: A man regularly called to serve on juries (wrongly) tells Jessica to profess her love for L.A. Law to avoid being selected, while the faintly caustic final joke of “Citizen Jessica” is that only four people in the Huangs’ precinct turn out to vote. Perhaps, after an election in which many eligible voters cast no ballot at all, the real import of Fresh Off the Boat this season has been to connect the meaning of citizenship to the work it requires, and thus to reject its recent redefinition, under Trump’s white nationalist aegis, as a function of race, ethnicity, religion, and/or birthplace. Of course, being an American has nothing to do with night markets or Walmarts, McRibs or milkfish, but with the willingness to perform citizenship’s labor of love. By the time Fresh Off the Boat weaves together Louis’ romantic reminiscences, Jessica’s misquotation of the Pledge of Allegiance (“I, Jessica, take you, the United States of America, as my lawfully wedded country”), and a series of comic flashbacks in “How to Be an American,” the labyrinthine application process seems proof enough of Jessica’s desire to participate in the democratic experiment—certainly far more work than I, a natural-born citizen, have ever exerted on this front. 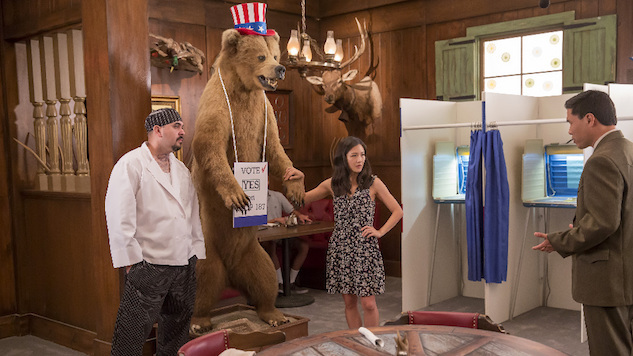 In the end, Jessica’s first flubbed recitation may not describe her feelings about America, to which she needed time to grow accustomed, but of my own appreciation for Fresh Off the Boat’s funny, affecting take on the meaning of citizenship, I must say, she nails it. Fresh Off the Boat airs Tuesdays at 9 p.m. on ABC.